The rise of the hip hop culture created a faithful allegiance to brands like FUBU, Karl Kani, Roca Wear, Ecko, Mecca and Enyce. If you’re over the age of 30 you’re probably ready to shake off those kicks and trade in your hoodies for something more mature. In fashion there always comes a shift. Trends come and go. Over the years the most popular brands have had to adapt and evolve to stay with the times. The dominance of the extra baggy jeans, oversized shirts and un-tailored clothing is not as popular as it was in the 1990’s and early 2000’s. As superstars like Kanye West, Lupe Fiasco and Sean Combs trade in their baggy pants for slimmer cuts with European tailoring, the trend is trickling to the masses. Over the last few years Black men have gradually been making a change in their wardrobe choices. No longer can it be assumed that all Black men want to wear jeans that are hanging so low they can barely walk down the street without having to pull them up every 5 seconds. 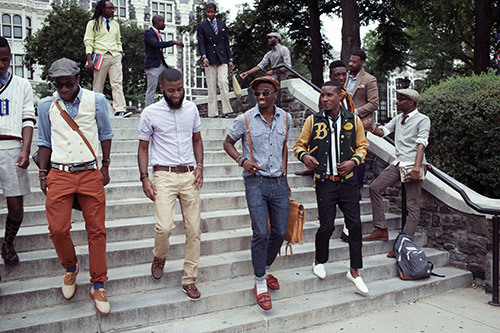 Street style for Black men is not just about hip hop. But rather it’s about taking elements of the street and bringing it together with fine tailoring, styling and retro inspired appeal. These days it’s cool to see a young man in the streets of Brooklyn wearing a flat-front pair of slim cut trousers and a body skimming (not skin-tight) polo shirt tucked into his pants. Vintage style is infiltrating the fashion sense of Black men. There’s a preppy appeal inspired by the classic tailored looks of the 1950’s and 60’s. Boat shoes, Oxfords, desert boots and Chuck Taylors are the footwear of choice for men onto this trend. A fedora hat, poor boy cap and suspenders are the added details that look just as cool today as they did during the heyday of Motown music. For the fall 2011 season, capturing this look is simple. It’s a Harlem Renaissance feel mixed with the modernism of the 21st century. Stores like Zara, H&M, Banana Republic and Club Monaco carry styles that will keep you on point for the season. If you’re in New York, check out the store The Brooklyn Circus. Known for a heavy dose in vintage items like shoes, hats and jackets. In Toronto check out Marlon Durrant for custom-made shirts. There is also a cool store called Jonathan + Olivia with interesting items you can mix into your closet. Shopping vintage is always one way to find unique items to update your wardrobe. 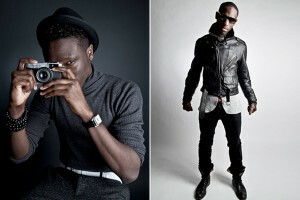 No matter what the trends are every man should own certain key items in his wardrobe. He should have two blazers (one casual and one corporate), dress pants and collared shirts. Two suits tailored to fit; one in black and another in a neutral shade like gray, brown or camel is very necessary. Wear bold coloured shirts, ties, hats and belts to accent your look. Of course a good pair of shoes and a watch to finish it off. When it comes to fashion don’t be afraid to get creative. 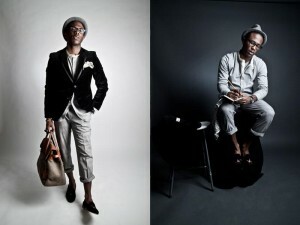 Remember that trends come and go and the key is finding what works for you and makes you your own man of style.